Words aren’t enough any more. We have to go a step further to inform, delight and engage our audience. With the increase of photo, video, infographics and screenshots – today’s marketers are discovering the power behind imagery in content marketing. But why should you join the party? Let’s look at why visual marketing is becoming a staple in the online consumer’s diet and how you can use it to your advantage. Today’s average consumer prefers visual content compared to word-based interactions. Communication coupled with imagery – photographs or video – is easier to process and more entertaining than words on a blank canvas. Forbes Insight reports that nearly 60% of senior executives prefer to watch video instead of reading text, if both are available on the same page. But visual marketing is more than giving consumers what they want. Visual marketing can be a huge asset for marketers who want to draw a sharing response from consumers. Consider the response rate of tweets coupled with images. Tweets with images receive 18% more clicks, 89% more favorites and 150% more retweets. People feel compelled to share meaningful content, and the strongest way to enhance your message is by including a visual element. Not only are consumers sharing visual marketing – they remember it as well. An infographic in AdWeek shared that people remember 80% of what they see or do, versus 20% of what they read. Imagery in content marketing is a “must” if marketers want to make a lasting impression on consumers. With this in mind, marketers should focus on creating visual content over text and audio. In doing so they quadruple the likelihood that a consumer will remember messages. How can I make sure my visual marketing is powerful? Not all visual marketing is created equal, and it is only powerful when executed properly. Marketers shouldn’t expect to see big changes by adding a simple stock photo to tweets. Stock photos may be an easy way to add a visual element to a blog post, but there are better ways to execute visual marketing. Adding an infographic or a short video outlining key points can make content much more meaningful to the consumer. In larger works, like eBooks and white papers, an animated character or theme can tie the work together while keeping the reader engaged. However, if your hands are tied and you’re at a loss for original images, using a relevant stock photo is better than completely foregoing a visual element. 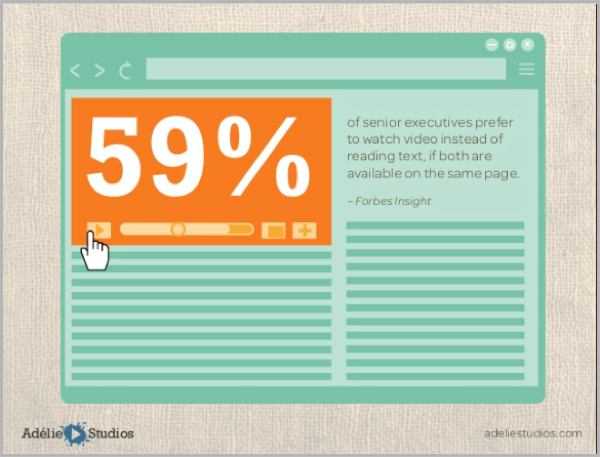 Reports show that 40% of people respond better to text coupled with visuals than plain text. Although stock photos may not be ideal or original, these images will garner more attention than no visuals at all. Visual marketing can be an asset because of its ability to inspire consumers to take action. Marketers should ensure that they are taking advantage of this capability by including a call-to-action (CTA) with their visual marketing. Calls-to-action can range from low action (check out our website) to high action (register now, make a purchase). Not all CTA’s have to be obvious. By drafting creative, stimulating content, consumers will feel compelled to share your work with others. By simply providing a solid piece of imagery (think: infographic), you can inspire your audience to advocate for you without actually having to ask. It is imperative that all visual marketing encourages consumers to do something. Otherwise, your content (and hard work!) is a complete waste. You can tweet the best video content with links to landing pages on your website… But if your site is not optimized for mobile, this means nothing to the consumer trying to access your site from their smartphone. This is one example of poor omnichannel marketing steamrolling a carefully constructed piece of visual marketing. Consumers should be able to access all touch points of your company without a hitch. Encountering an incorrectly linked landing page or receiving conflicting messages across two separate platforms can be a major turnoff for consumers. Ensure that you are producing seamless content with omnichannel marketing to avoid confusing or frustrating customers. There’s certainly a lot to think about when integrating imagery in content marketing. But, if done correctly, visual marketing can be the most powerful tool a marketer can use to generate leads and make sales. Guest Author: Savannah is a writer for SaaS platform NectarOM, and loves discussing marketing personalisation, automation, data analytics and CRM. Connect with her on Twitter or check out more on the NectarOM.